In this post we explore how to configure various aspects of a SharePoint 2010 service application. 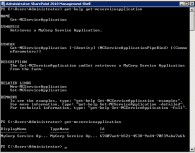 This includes building some customizations in the application pages and extending the service application with powershell scripts. It is really up to your imagination when it comes to what you want to include and how you want to manage your service app, SharePoint gives you a tremendous amount of flexibility when it comes to these things.